Contact Us * How can I help? Believe or not these are the only toilets at the Baylor Wharf Public Health Unit (PHU). This community suffered during the recent cholera outbreak. They reported over 350 confirmed cases. This is a community of over 5,000 people and we counted 13 active toilets including this one. Open defecation is common practice here, people use the beach and the open bush for toileting. So how do we take a community in such poor shape, that has suffered so much and give them hope for a future? Mariatu's Hope partners with local Government, NGOs, International NGOs, Churches, Donor Institutions and individuals to implement WaSH programs in Sierra Leone. One of our key strategies is student lead total sanitation (SLTS). 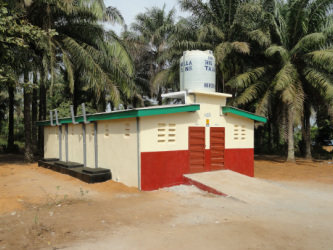 This involves equipping a school with a safe water source, composting toilets, health and hygiene training that empowers the students to initiate positive WaSH development in their communities. In these schools we develop Child Health Clubs and currently have over 750 members that we actively use in training communities about better health, hygiene and sanitation practices.